Note: A minimum quantity of 105 must be ordered, and in units of 5 thereafter. 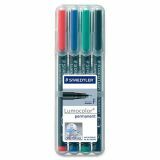 Staedtler Lumocolor Permanent Pen 318 - Quick-drying permanent markers with fine point contain ink that won't bead or smudge. Dry-Safe ink allows the marker to be left uncapped for days without drying up. Automatic pressure equalization prevents the pen from leaking on board aircraft. Compact permanent marker also includes a cap with a clip for attaching to notebooks, pockets and more. Write on overhead transparency film or such glossy surfaces as CDs/DVDs, photos, transparency sleeves, slide frames, cromalins, glass, acrylic and vinyl. Color-intensive, low-odor, xylene-free ink dries in seconds so the markers are ideal for left-handers. 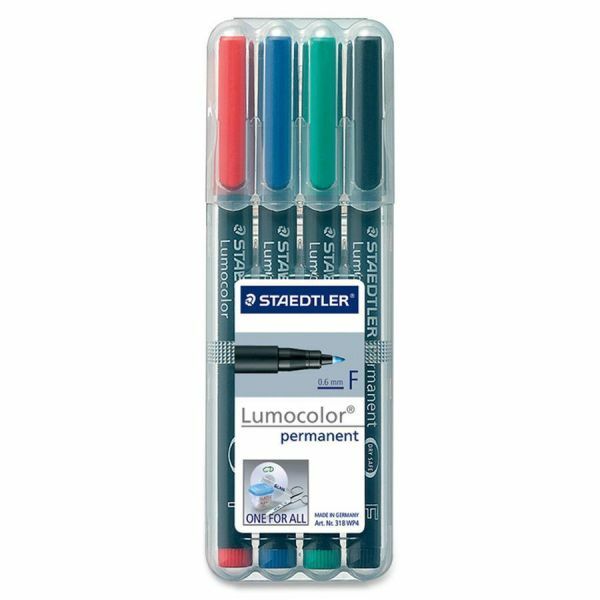 Correction pen (sold separately) accurately clears film of all Lumocolor markings. Deleted areas can then be immediately remarked.